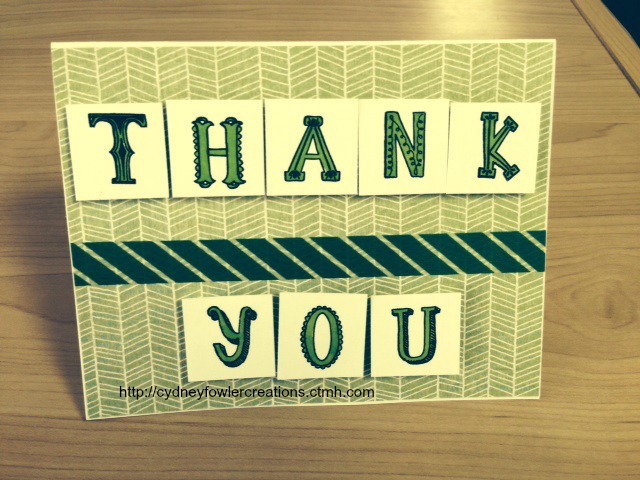 Welcome to the Damask Divas August Blog Hop featuring the Chalk It Up paper pack. If you got here from Judy’s blog, you are in the right place. You can always go to the Damask Divas blog to start from the beginning and/or to see the entire list of participants. 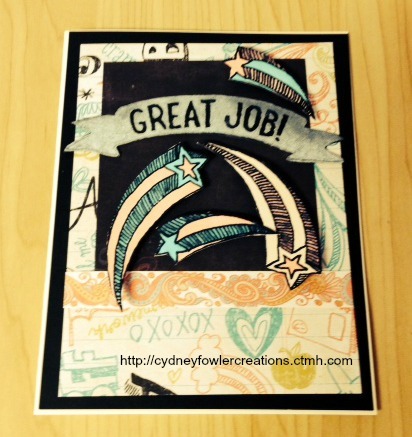 I created a cute card using the featured papers and the new Great Job stamp set. I used the Colonial White pigment ink pad so it looked like chalk on the black paper. Remember to let the pigment ink dry well. It goes on thick so I blotted it to make it look more see through like chalk. I fussy cut the Great Job and the shooting star shapes out. I used the new Touch markers to color the shooting stars and pop dotted them for dimension. I also used the zip strip from the graphics paper to make a “ribbon” under the saying. The smaller black square is the reverse of the paper that also has a chalkboard look to it. The card base is Colonial White. I like to use the pre-made CTMH card bases that come with envelopes. You get a pack of 50 cards and envelopes for $14.95 and they look professional. I used archival ink to stamp the shooting stars since I was going to color them in with markers. The archival ink won’t bleed from the markers. I hope this card inspires you to make your own creations. To shop for these items and many more exciting items from the new Annual Inspirations Idea Book, go to my personal online CTMH store at http://cydneyfowlercreations.ctmh.com or contact your own consultant. We are always happy to assist you. 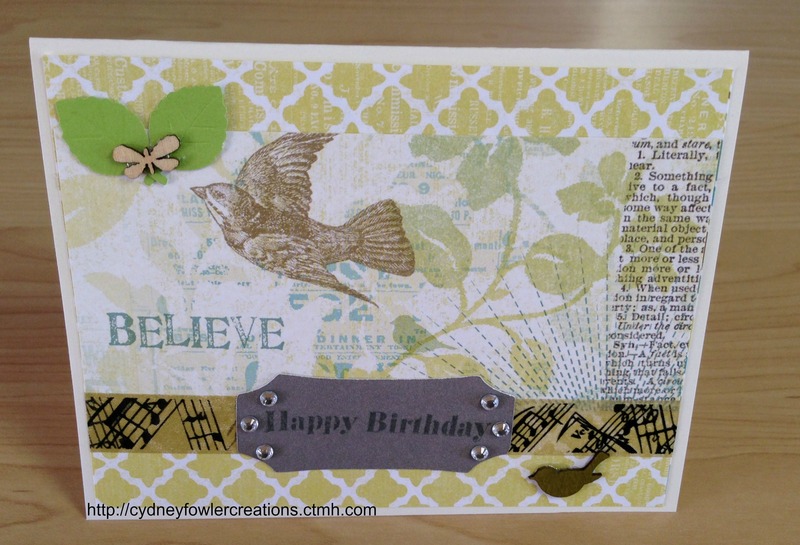 Next up on the blog hop is Hilary. Click here to go to her blog and enjoy even more Chalk It Up inspiration! Happy Crafting! Welcome to our monthly Damask Divas blog hop. We are featuring the Skylark paper pack. If you got here from Brenda’s blog, you are in the right place. You can always start from the beginning by going to the Damask Divas blog where you will find a list of all of the participants and links to their blogs. I created a few cards. I just love the paper with the birds and dragonflies so I cut my paper to highlight those images. I added some embellishments – wood color ready shapes that compliment the design, washi tape, the zip strip from the edge of the paper, some leaves and bling. These papers are perfect for Spring and Summer. The colors are very soothing and peaceful. That beautiful blue bird is part of the paper design not an embellishment! This paper would be great as a scrapbook page background as well. 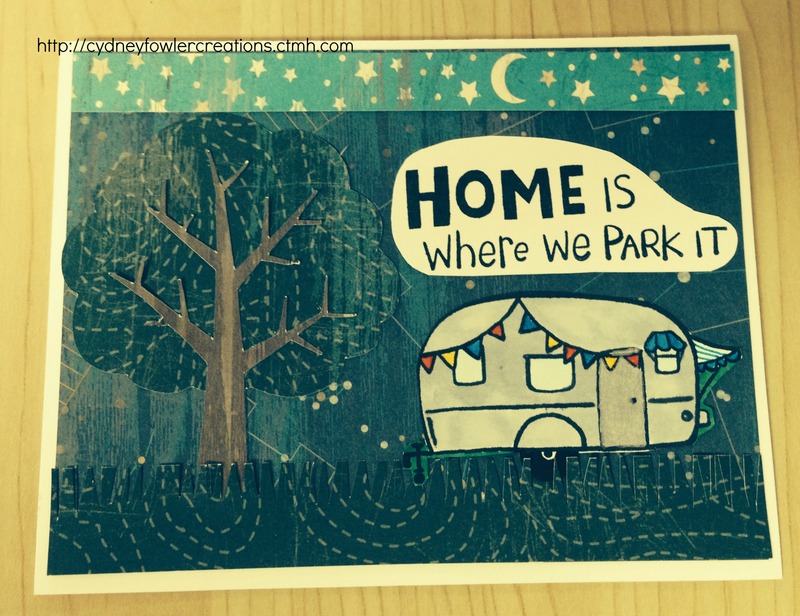 I hope these cards give you some crafty inspiration. If you want to purchase Close to my Heart papers and crafty goodness, go to my online store by clicking here, or contact your own consultant. We are all happy to help you. Next up on the hop is Felica. Click here to go to see what she has created for your viewing pleasure. Happy Crafting! Welcome to the Damask Divas Blog Hop for May, 2014. If you got here from Jamie’s post, then you are in the right place. You can always go to the Damask Divas Group Blog to see the entire list and/or start at the beginning. 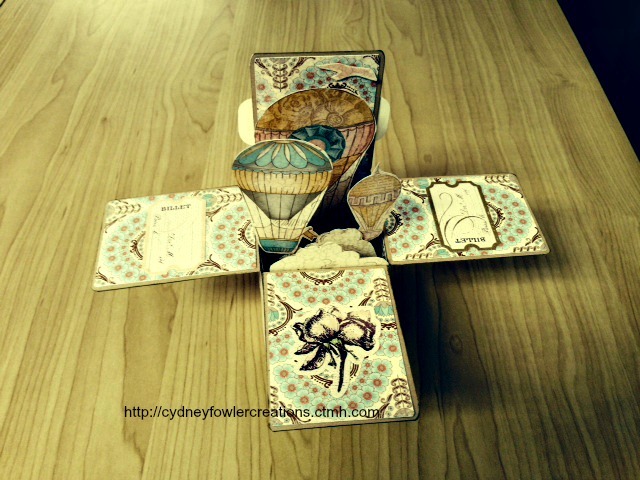 This month we are using the Close to my Heart paper pack “Balloon Ride.” It is one of my favorites. 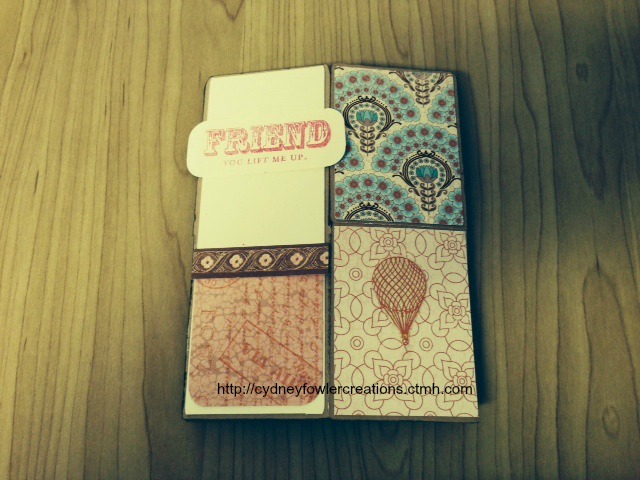 I have been wanting to make a box card and decided I would give it a go with this paper pack. Melody Lane made the project available to her followers in Design Space so I was able to use my new Cricut Explore to do the cutting on the box. I cut the balloons and clouds out by hand. The rest of the decor is from embellishments I had on hand (La Belle Vie, Picture My Life, etc.). 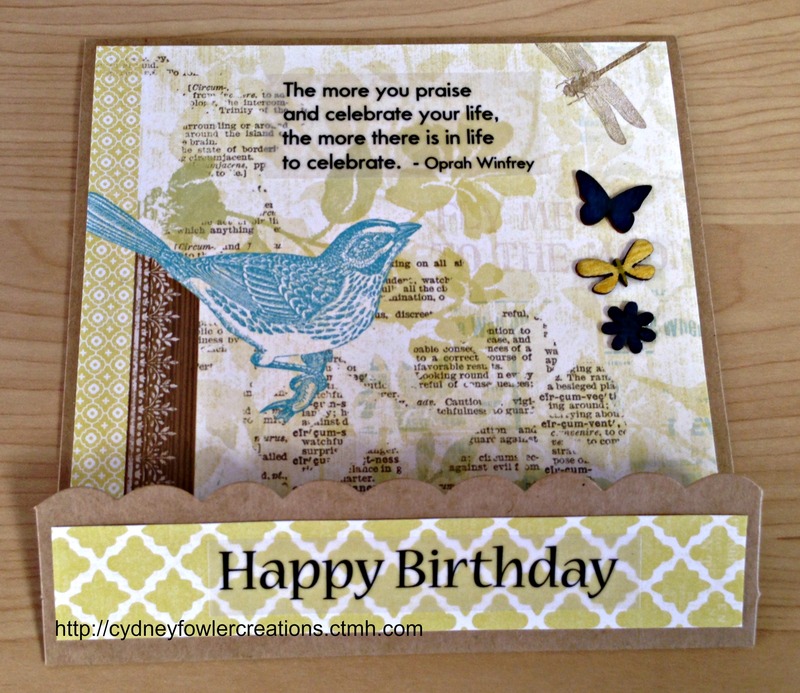 The sentiment is from the CTMH stamp set “Give a Lift” and it also has cute balloons. Next time I use this paper pack I will use the balloons in that stamp set too. These items and many more are available from Close to my Heart. Shop my online store – click here – or shop with your own consultant. We are all very happy to serve you. Next on the hop is Kelly. 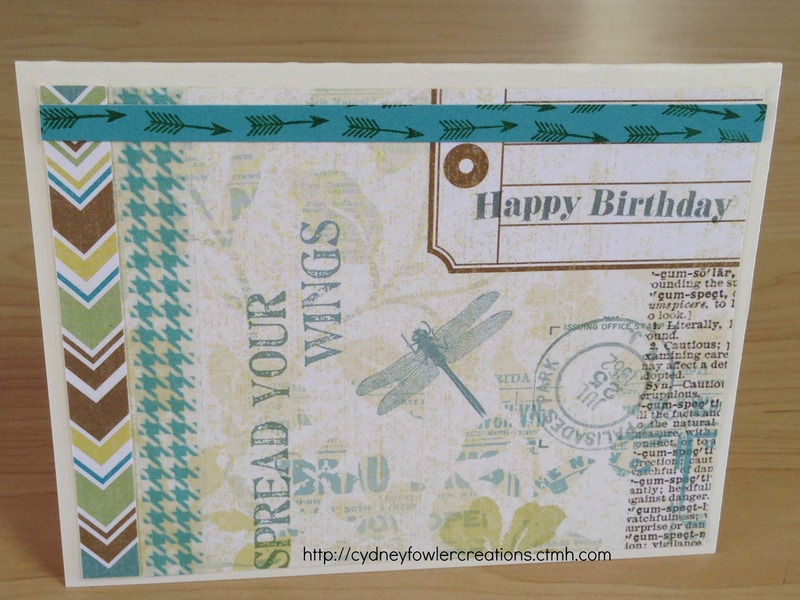 I hope you enjoy seeing all of our creations using this fun hot air balloon themed paper. There are several beautiful patterns and colors in this pack. Happy Crafting! 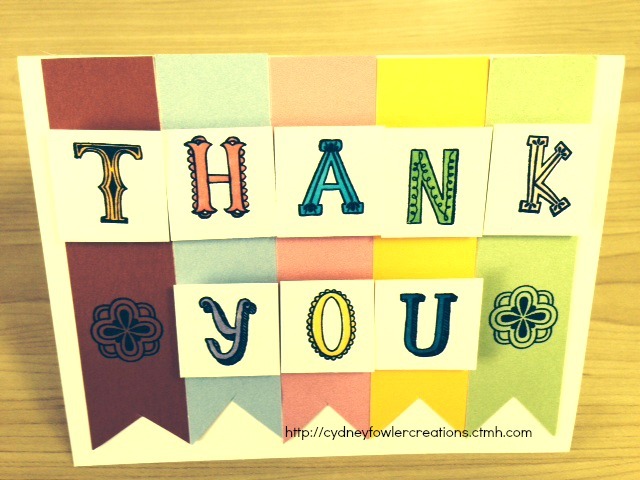 Welcome to the March 2014 Damask Divas blog hop featuring the new CTMH paper pack, Lollydoodle. Such a fun and bright collection of papers. If you got here from Ronnie’s blog, you are in the right place. You can always start at the Damask Divas blog site if you get lost or want to start at the beginning. 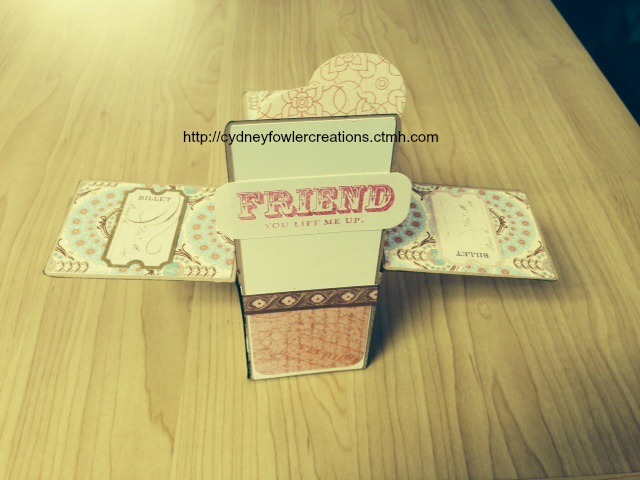 I created a fun Spring mobile using the Lollydoodle paper pack. I used the CTMH Artiste cartridge to cut the rosettes. I made two of each pattern so I could turn one or the other side out. So easy – just cut two for each rosette, glue the two strips together, fold on score lines, fold as directed in the Artiste booklet and glue a circle or flower on the center of both sides to hold it all together. I cut small flowers out of a scrap of Lollydoodle paper to hold the center of the rosettes. I then tied them on a cute little bird cage with ribbon I had on hand. You could use fishing line instead. I made a double sided paper bird from the Artiste cartridge so I would have a birdie in my little cage. Cute! I put the mobile on a hook in the ceiling of my shop and took a photo. With the door open the mobile moves in the slight breeze. I am sure I will be making more of these. I have a stash of the little bird cages. I hope you enjoyed seeing this project. To buy Close to my Heart supplies from me just visit my online store by clicking here or see your own consultant for ordering. The item number for the Lollydoodle paper pack is X7183B. The Artiste CTMH cartridge is Z1790. Next up on the hop is Kelly. Click here to go to her blog. Happy Crafting! 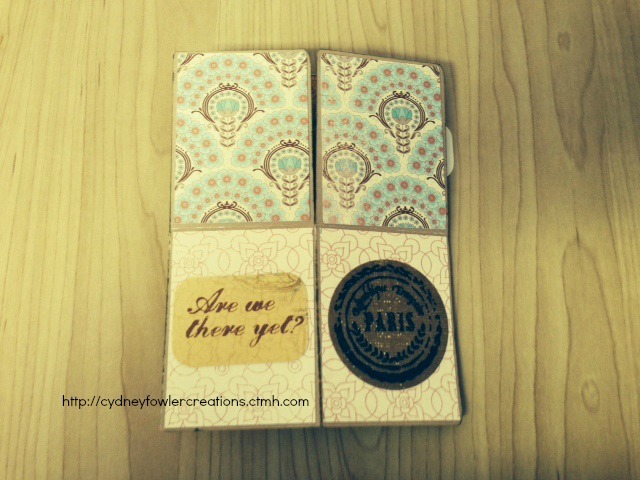 Welcome to the Damask Divas blog hop for February 2014 featuring the new Ivy Lane paper pack by Close to my Heart. If you came here from Brenda’s blog, you are in the right place. You can always start at the beginning or hop around by going to the Damask Divas blog for a list of all participants and links to their blog posts. 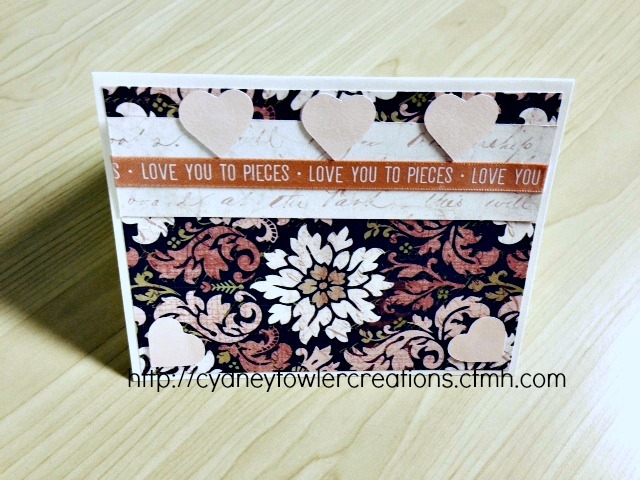 I used the new Ivy Lane paper pack to make a Valentine’s Day card and candy set. I made a pretty card with the floral paper, some hearts, the pale pink reverse of the chevron paper and some ribbon I had on hand. Who would not love to receive such a pretty set? Well, maybe a guy would not care for it. That should be my next project – something more masculine for Valentines Day. You can wrap the chocolates in a variety of patterns for different occasions. 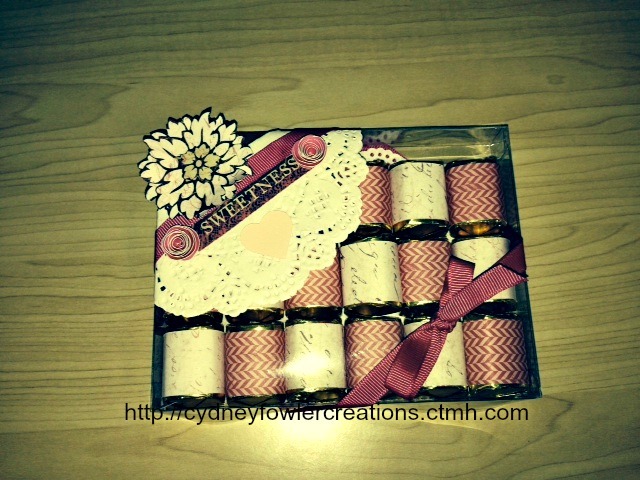 You can also use your CTMH stamps to stamp patterns on address labels and wrap the chocolates with the labels. The pink/red chevron and pale pink paper with faint writing work well together for a Valentine vibe. I cut 1″ x 3″ strips to cover Hershey nuggets. Just put a narrow strip of adhesive on each end on the opposite side of the pattern you want to show. As you can see I alternated mine, but you could use all one color. I placed a doily and piece of paper in the bottom of the box before filling with the candy. I cut two of the same flower out of the Ivy Lane floral paper. I cut the middle out of one. I layered the one with the resulting hole on the bottom, then the complete one on top. I then used a pop dot to adhere the middle to the top of the flower to give it dimension. I also curled the edges of the petals a bit with my fingers. The word “sweetness” is from the tear strip on the 12 x 12 sheet of paper. I folded a paper doily I had on hand in half and taped it over the corner. I then added the flowers, saying and a heart cut out on the Cricut using Artiste. I cut pages of different size and color hearts for my Valentine projects I am working on, so I just used some of the hearts for this project. I had the smaller roses and ribbon on hand from another project. I like to raid my stash when making projects so I can use what I have on hand. I feel like if I really use everything then I can get more! 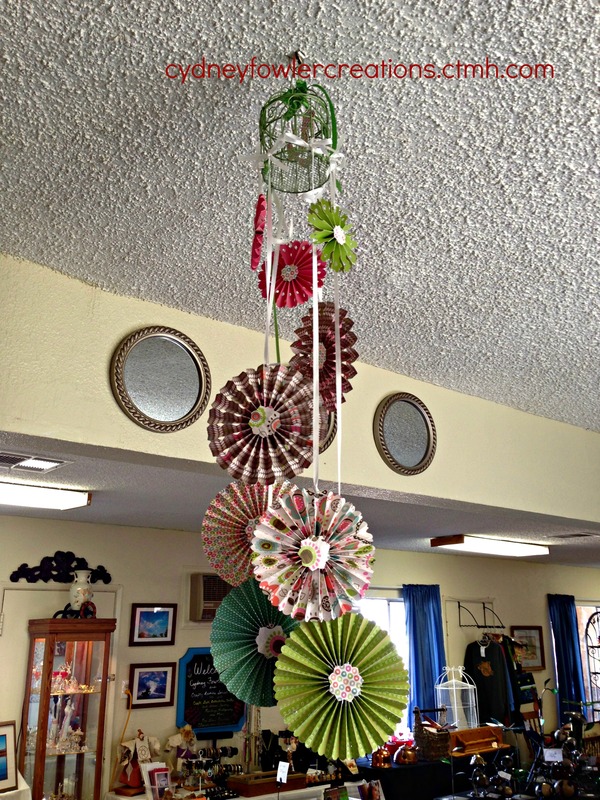 I love paper and all things crafty! I hope you enjoyed seeing my projects. You can purchase Close to my Heart supplies and tools online from me at http://cydneyfowlercreations.ctmh.com or from your own consultant. The Ivy Lane paper pack is item number X7178B. There is an awesome new Idea Book and Catalog released February 1. So many wonderful supplies and ideas – something for everyone. Be sure to check it out! Next up on the hop is Traci. Click here to hop on over and see what she has created! Happy Crafting!